This article is about Mii Swordfighter's appearance in Super Smash Bros. Ultimate. For the character in other contexts, see Mii. The Mii Swordfighter (Mii剣術タイプ, Mii Fencing Type) is a playable character in Super Smash Bros. Ultimate. They were confirmed as a playable character on June 12th, 2018, along with the other Mii Fighter types, Brawler and Gunner. Mii Swordfighter is classified as fighter #52. As with the other Mii Fighters, they have 12 voice options, provided by Yuji Kishi, Takashi Ohara, Ryotaro Okiayu, Michihiko Hagi, Hideo Ishikawa, Kiyoyuki Yanada, Umeka Shoji, Ayumi Fujimura, Makiko Ohmoto, Minami Takayama, and Kimiko Saito. Much like the Mii Gunner, the Mii Swordfighter retains most of their previous moveset, with the majority of the Swordfighter's changes being alterations to how their moves behave. While their changes are not as drastic as the Mii Brawler (who received four entirely new special moves), the Swordfighter has nevertheless received an abundance of buffs. Like the other Mii Fighters, the Mii Swordfighter now has set attributes, including middling weight (which is identical to that of a default-sized Mii Fighter in Smash 4) alongside high air speed, but average or below-average stats otherwise (falling speed, air acceleration, walk speed, run speed). As a result, the Swordfighter's role as the middle-ground Mii Fighter has been reinforced. The Swordfighter's default moveset has not been changed significantly, with only several attacks being altered (dash attack is now a wide dashing slash, and up smash now consists of two slashes that can hit thrice in front). However, the Swordfighter's aerial attacks have been given lowered lag due to the universal reduction of landing lag, patching up the Swordfighter's notorious lag issues in SSB4. As a result, the Swordfighter arguably benefits the most from universal changes (in comparison to the other Mii Fighters), as many of their aerials can now start true combos and function as safe landing options, which is additionally beneficial due to their use of a disjointed weapon. The biggest changes come from the Swordfighter's special moves. While only one of their special moves has been renamed (Slash Launcher is now Gale Stab), the majority of the Swordfighter's specials have significantly improved utility. Many now deal much higher damage, stronger knockback, or both (like Blurring Blade for example) giving the Swordfighter an abundance of powerful options for KOing and fixing another of their former weaknesses. The Swordfighter now has access to extremely effective combo starters courtesy of changes to their projectiles: Gale Strike deals much more damage, functions as a standard projectile, and now has fixed knockback with high hitstun, making it one of the most powerful combo initiators in the Swordfighter's arsenal. Shuriken of Light can now lock opponents despite its lowered damage, and gains speed as it travels. Chakram travels faster when smash thrown and deals more damage, while the slow version now lingers and returns to where it was thrown, turning it into an approach-deterring and ledge-trapping tool. Finally, due to the changes to their specials, the Swordfighter's previously mediocre default moveset has been addressed with buffs, allowing them to function just as effectively with their default moveset. Alongside the buffed Gale Strike, Stone Scabbard functions much better for recovery and is capable of KOing, Airborne Assault no longer leaves the Swordfighter helpless and deals more knockback, and Blade Counter can now initiate combos at low percents, or KO effectively due to its vertical angle. However, the Mii Swordfighter still retains some glaring weaknesses, including passable range for a disjointed weapon user, average ground mobility due to their new attributes, below-average frame data for many of their ground moves, and extremely weak throws, the latter two of which have not altered significantly from their transition to Ultimate (and in the case of their throws, have not been changed at all). Overall, the Mii Swordfighter's numerous buffs heavily outweigh their nerfs, making them much more effective than in Smash 4; the Swordfighter has attained surprisingly decent representation in the early metagame as a result of this. However, the Mii Swordfighter's viability compared to the cast and, more significantly, the legality of custom moves in tournaments, are still yet to be seen. Players can customize the Mii Swordfighter's voice clips from 12 different voices, with 3 different pitches. Mii Swordfighters have had their body proportions adjusted. 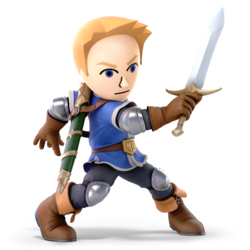 While still based off the "Guest B" Mii, the default Mii Swordfighter has an altered appearance, including shorter hair and thinner eyebrows. The default outfit for the Mii Swordfighter has significantly more detail, with the Swordfighter now wearing a tunic, with additional armor pieces and a sheath. Like all characters, the Mii Swordfighter's jumpsquat animation now takes three frames to complete (down from 7). The Mii Swordfighter now has a set weight of 100, on par with that of Cloud. This is identical to that of a default sized Mii Fighter in Smash 4. The Mii Swordfighter walks slower (1.188 → 1.07). This affects their mobility significantly compared to the cast, as they are now the 50th fastest walker (compared to 19-20th fastest in Smash 4). Mii Swordfighter dashes faster (1.5 → 1.58). Mii Swordfighter's initial dash speed is faster (1.3 → 1.74). Mii Swordfighter has slightly higher air acceleration (0.04 → 0.05). Mii Swordfighter has a significantly higher air speed (0.96 → 1.17), giving them the 18th highest air speed in the game (compared to 53-59th in Smash 4). Mii Swordfighter has a slightly slower falling speed (1.6 → 1.55). Like almost all characters, the first two hits of neutral attack can now lock. First hit of neutral attack does less damage (4% → 3%). Down tilt has slightly less ending lag, improving its safety and combo ability. Dash attack is now an outward swipe instead of an outward stab, similar to Toon Link's. Dash attack has 1 less frame of startup (frame 9 → 8). Dash attack now consists of a single hitbox, thus losing its weaker late hitbox that dealt 6%. It also has more vertical range, deals more knockback and sends at a semi spike angle, improving its KO potential near an edge. Dash attack has a shorter duration and less horizontal range. Forward smash has 1 less frame of startup (frame 16 → 15). Up smash now consists of two slashes instead of three. This reduces the amount of time the Swordfighter is stuck in lag, but also reduces up smash's hitbox duration. Up smash's previous second hit has now been moved behind the Mii Swordfighter. This means the move still hits thrice if the front hit connects. Up smash's altered hitbox placement now allows it to hit opponents touching the Mii Swordfighter's back, although this will only deal two hits. Up smash deals more knockback, reliably KOing at around 115%. All aerials have significantly lower landing lag (Neutral: 15 → 9, Forward: 17 → 13, Back: 15 → 10, Up: 16 → 11, Down: 30 → 19). Neutral aerial starts one frame later (frame 11 → 12). Neutral aerial's lowered landing lag allows it to initiate combos much better than before. Forward aerial's lowered landing lag makes combos from the first two hits more effective. Back aerial has a slightly altered animation as the Swordfighter leans forward slightly. Back aerial's lowered landing lag gives the move better combo potential. Up aerial's lowered landing lag allows the late hit to start combos. Down aerial has an altered animation, with the Swordfighter now stabbing downwards and twirling with their sword instead of turning upside down completely. Down aerial's looping hits deal slightly more damage (1% → 1.5%). Grab has more ending lag (FAF 29 → 35). The Mii Swordfighter's pummel is now a knee strike. It is significantly faster but deals much lower damage (3.25% → 1.3%), but this is a buff overall due to the Swordfighter's previously sluggish pummel. Back throw's kick has now been changed to a roundhouse kick behind the Swordfighter. Down throw now throws opponents to the ground, similar to Marth's. Gale Strike now has set knockback and higher hitlag. This grants it newfound combo potential, and gives the Swordfighter an almost guaranteed followup if it lands. This tremendously improves what was previously one of the least effective projectiles in the game. The gale deals significantly more damage (early: 3.7% → 13%, middle: 2.9% → 11%, late: 2% → 10%). The gale starts faster (frame 23 → 20). The gale travels a smaller distance, only half of Final Destination. It has also lost its pushing ability at the end, removing its utility to blow opponents and items away. The gale now has transcendent priority, meaning that it can no longer clash or neutralize projectiles, but can now beat out all direct attacks, even those with much greater damage outputs. The throwing animation has been altered: it is now a quick ninja-like finger flick near the Mii Swordfighter's torso. Shurikens now gradually pick up speed as they travel. Shurikens are thrown faster (frame 16 → 13) and have less ending lag (FAF 50 → 38), making it function better as a conventional projectile. Mid-range and long-range shurikens can now lock. Max range shurikens deal significantly less damage (10% → 6.5%). Blurring Blade now sets the Swordfighter's blade aflame for its duration, deals flame damage, and ends in an upward slash, rather than a thrust. The final hit has a larger hitbox because of this. Blurring Blade deals much higher damage across all charge levels (9.9 ~ 23.75% → 12 ~ 28.8%). It also has much higher knockback, allowing it to KO very early (100% uncharged, 24% fully charged at the edge of Final Destination). The move can now be reversed after charging, similar to Roy's Flare Blade, but it can only be reversed once. Airborne Assault is no longer a chargeable move, and travels a set distance (about 3/4 of Final Destination). Airborne Assault travels further on average when compared to the previous uncharged variant. Airborne Assault deals higher knockback, allowing it to KO at high percents. Airborne Assault deals significantly more damage than the previous uncharged version (7.2% → 12%), but less than a full-charged version (16% → 12%). The move will stop at a ledge if it happens to pass one. This eliminates accidental self-destructs while using the move, but also makes it harder to pursue offstage opponents or those on a different platform. Airborne Assault now has around a half-second window where the Swordfighter can act to bypass helplessness if the Swordfighter uses this move in the air, but if the move hits an opponent, the Mii won't be helpless. This significantly improves the Mii's recovery. The bounce gained from hitting an opponent travels higher, making it safer to use against shield. Airborne Assault's rebounding animation has the Mii perform a flourishing backflip, with a larger sword trail accompanying it. Chakram has a bigger hitbox. Fast charkrams deal more damage (6.5% → 8%). Slow chakrams now behave like a short-range Boomerang, staying out for a longer duration and slowly returning to where it was initially thrown, dealing 1.1% per hit. This improves its ability to wall out approaches and initiate combos, and also allows it to ledge trap and edgeguard. Gale Stab (formerly Slash Launcher) has a new animation that has the Mii perform a charging stab rather than a reverse-gripped slash. If it misses, the Swordfighter will brake on the ground; if it hits, the Swordfighter will hold their sword in a stabbing motion forwards. Gale Stab starts faster (frame 13 → 9). Gale Stab deals much more damage when fully charged (10.2% → 18.5%). It also deals much more knockback, allowing the charged versions to KO. Gale Stab now slows down upon hitting an opponent. It also deals slightly less damage late unless uncharged. Gale Stab cannot sweetspot ledges during its ending animation if it hits an opponent. Stone Scabbard's descending trail is now blue instead of yellow. The move now has a unique sword sound byte at the end of the move if an opponent is hit. Stone Scabbard travels much higher and grants more horizontal momentum at the start and right before falling, significantly increasing its usefulness as a recovery move. Stone Scabbard can now sweetspot ledges from behind while falling. Stone Scabbard's rising hit has a larger hitbox. Stone Scabbard's landing hit is significantly stronger, allowing it to KO within the 110% range at the edge. Stone Scabbard's first hit deals less damage (5% → 4%). The sword's hitbox when going through platforms also deals less damage (6% → 3%). Skyward Slash Dash's ascending trail is now orange instead of yellow. Skyward Slash Dash has significantly less startup lag (frame 24 → 14). This leaves the Swordfighter less vulnerable to attacks and functions much more like a surprise attack. Skyward Slash deals significantly higher total damage (12% → 21.2%). Hero's Spin now has identical particles as Spin Attack, albeit colored purple. The Swordfighter also undulates during the spin, much like the mentioned attack. Hero's Spin deals slightly higher total damage in the air (14% → 16.8%) and on the ground (12% → 17.0%). Hero's Spin has massively higher knockback, allowing it to KO from the air from around 75%, and often earlier. Blade Counter has a new visual effect, and now retaliates with an upward slash. The counter now causes opponents to recoil before the counterattack. The counterattack now sends opponents vertically, similar to Counter Surge, and has lower ending lag. At low percents, this makes it possible for follow ups. Blade Counter's vertical launch angle improves its KO potential at higher percents in general, but worsens its KO potential against strong attacks close to a side blast line. Reversal Slash's graphic is now an S-shaped swirl, instead of a C-shaped slash. Reversal Slash's damaging hitbox starts later (frame 12 → 16). Its reflecting hitbox stays the same (frame 5). Reflected projectiles deal increased damage (1.5× → 1.8×). Power Thrust now causes the Swordfighter's sword to glow purple instead of blue. Grounded Power Thrust deals more damage, with the middle hitbox now dealing as much damage as the previous early hitbox (tipper/blade early: 13/10% → 15/12%, tipper/blade middle: 11/8% → 13/10%, tipper/blade late: 8% → 10/7.5%). Grounded Power Thrust deals significantly higher knockback throughout all charge levels, allowing the early tipper to KO at 100%, and the middle hits at around the 115% range. Grounded Power Thrust now stops at ledge. This prevents going offstage and attacking players offstage. Aerial Power Thrust's landing hit deals significantly higher knockback, KOing at around 105% at the edge of Final Destination. Final Edge now causes the Mii Swordfighter to rapidly perform slashes while each beam comes out instead of holding the sword skyward. Like every other Final Smash, Final Edge features a special background effect; the Swordfighter's background effect is purple. Final Edge is performed significantly faster, generates more beams at once and is stronger than before. Final Edge has had its range reduced, only covering all of Final Destination; this significantly reduces its KO potential considering that there is no finishing projectile at the end of the move. Fixed a game crash along with Duck Hunt where Wild Gunman and the Mii Swordfighter's special move were used at the same time. Corrupt data occurs along with Duck Hunt if they play Century Smash. 3% Performs an inward slash, followed by an outward slash, and concluded with an upwards-arching slash. The first 2 hits can lock. 7% Slashes in an arc above their heads. This covers the Swordfighter's entire body. 8% A low sword thrust along the ground, similar to Marth's down tilt. Has low ending lag, and launches opponents slightly upward. Great for starting combos. 10% Performs an outward swipe while sliding forward. 14% (hilt), 15% (blade), 16% (tip) Steps forward and, with both arms, swings their sword downwards and inwards. Deals good knockback and has surprisingly high range, but suffers from high lag on both ends. 4% (hit 1), 3% (hit 2), 7% (hit 3) Jumps and performs two corkscrewing slashes over their head before touching the ground. There is a hitbox in front of the Swordfighter just before the first slash comes out, which will hit opponents in front of the Swordfighter a total of three times. Anyone touching the back of the Swordfighter will only be hit twice. 12% (front), 15% (back) Crouches and slashes low to the ground: first in front, and then behind. 8% Slashes in a circle while doing a corkscrew in the air. A good spacing and approach move that can be used to initiate combos when used close to the ground. 3% (hits 1 and 2), 5% (hit 3) Stabs forward three times, each stab at a slightly higher angle than the last. The first two hits trap opponents into the final hit, which deals good knockback. The first two slashes can be used to start ground combos. 14% Spins to perform an extremely fast backwards slash. One of the Mii Swordfighter's more reliable finishers, especially in the air. 16% (clean), 10% (late) Points the sword above their head and spins. Very powerful when hitting clean, and the late hit can be used to initiate ground combos. 1.5% (hits 1-5), 5% (hit 6) Spins while holding their sword beneath themselves, hitting multiple times like a drill. Upon landing, the landing impact will create a shockwave that launches opponents away. — Reaches in front on them with their free hand. 3% (kick), 3% (throw) Front kicks the opponent away. 3% (kick), 3% (throw) Knocks the opponent away with a roundhouse kick. 2% (slash), 3% (throw) Tosses the enemy up and then performs a midair spinning slash to knock them away. 2% (slam), 2% (throw) Slams the opponent on the ground. 7% Swings the sword around themselves while getting up. 7% Swings the sword in a back-to-front circle while getting up. 5% Swings the sword front to back before standing back up. 9% Climbs onto the stage and stabs forward. Default Gale Strike 13% (clean), 11% (mid), 10% (late) Creates a small tornado and sends it forwards. The tornado travels half the length of Final Destination, dealing less damage as it travels. The projectile is unique as it deals set knockback, and as such retains the old knockback physics, giving it increased hitstun. This makes it a potent combo initiator, allowing aerial followups at any percent range. Custom 1 Shuriken of Light 2% (close), 3.5% (mid), 5% (mid-far), 6.5% (far) Throws a bright, translucent shuriken forwards. The shuriken gains more damaging power as it travels, unable to flinch opponents at point-blank range but doing more knockback at maximum range. The distance it covers, coupled with its spammability, makes it useful for camping. Custom 2 Blurring Blade 0.8% (hits 1 - 5, uncharged), 8% (hit 6, uncharged), 1.9% (hits 1 - 5, fully charged), 19.2% (hit 6, fully charged) The Swordfighter charges their sword, with the blade aflame, briefly before stabbing with the sword forward multiple times and finishing in a high-knockback upwards slash. The move can be reversed just before the attack is initiated. Default Airborne Assault 12% Gets into a charge-like stance, then launches at the enemy, somersaulting with the blade. Travels a set distance in a light arc, allowing then to hit downed and low crouching opponents. If used on any kind of platform, the Swordfighter will stop at the edge. The Swordfighter will perform a high-arc frontflip upon clean contact, or a high backflip if hitting a shield, making approaching safe. If used in midair, there is a period after the move concludes where the Swordfighter will be able to perform an additional action. However, if nothing is done during this period, the Swordfighter will enter the helpless state. Custom 1 Gale Stab 8% (uncharged), 18.5% (fully charged) The Swordfighter rushes forward, holding out their sword to stab. This move can be charged. Custom 2 Chakram 1.1% (per hit, slow chakram), 8% (fast chakram) Throws a chakram as a projectile that can be angled and sent upwards, downwards, or straight forward. If inputted like a smash attack, it will fly faster with increased range and damage. Otherwise, it will fly in front of the Mii Swordfighter and slowly return towards the position from which it was thrown (much like a boomerang), hitting multiple times. The chakram can be lodged into the floor and walls, but cannot be picked up. This move is good for walling out approaches and initiating combos, and also for ledge trapping and edgeguarding. Default Stone Scabbard 4% (hit 1), 3% (hit 2), 5% (hit 3), 3% (through platforms) Slashes upwards while jumping and then stabs downwards while falling. The second hit is a powerful meteor smash. The landing hit forces the Mii's sword through thin platforms, which damages opponents underneath. The Mii Swordfighter will not stop until it hits ground as soon as the second portion of the attack begins, making it easy to self-destruct off-stage with the move if not aimed carefully. Custom 1 Skyward Slash Dash 2.2% (hit 1), 3% (hits 2 - 6), 4% (hit 7) After a brief charge, the Mii performs a series of sword strikes while dashing in a straight line, which can be aimed in any direction using the control stick. Custom 2 Hero's Spin 14%/13%/10%/7%/5% (ground, uncharged front), 12%/11%/8%/7%/5% (ground, uncharged back), 19.6%/18.2%/14%/12.5%/9.8% (ground, fully charged front), 16.8%/15.4%/12.6%/11.2%/9.8% (ground, fully charged back), 3% (air hit 1), 2% (air hits 2 - 4), 5% (air hit 5) When used on the ground, the Swordfighter spins with their sword. If used in the air, the Mii will rise, doing multiple hits. The ground variant can be charged to deal even more damage. Functions much like the Spin Attack, but with poorer vertical recovery in exchange for extremely high knockback on the final strike when used in the air, able to KO middleweights from as low as 50% when initiated from the edge and drifting outwards for the duration of the attack. Default Blade Counter 1.5× (minimum 8%) The Swordfighter holds their sword in a reverse grip behind them. If hit, the Swordfighter retaliates with an upward slash, knocking opponents upward. This move has low endlag, and can be used to initiate combos at low percents (provided the countered move doesn't launch the opponent too high). Custom 1 Reversal Slash 6% (slash); 1.8× (reflection) The Swordfighter performs a slash, leaving an S-shaped rainbow-coloured swirl. The slash reflects projectiles and flips nearby opponents, similar to Mario's Cape. Custom 2 Power Thrust 15% (ground, clean sweetspot), 13% (ground, late sweetspot), 12% (ground, clean sourspot), 10% (ground, late sourspot), 13% (aerial, clean sweetspot), 11% (aerial, late sweetspot), 10% (aerial, clean sourspot), 8% (aerial, late sourspot), 7% (landing hit) The Swordfighter dashes forward quickly, stabbing with the sword. When used in the air, the Swordfighter launches at a downwards diagonal direction. The tip of the sword deals more damage. Final Edge 1.7% (shockwave, close), 2.4% (shockwave, mid), 3% (shockwave, far) The Swordfighter gets into a stance, and then proceeds to perform a series of rapid slashes, releasing multicolored shockwaves. The shockwaves deal more damage as they reach their maximum distance. The range of the Final Smash covers all of Final Destination if used at the edge. Appears from a whirlwind and unsheathes their sword. Up taunt: Throws their sword upwards, which twirls in the air, then catches it and transitions into a defensive pose. If done repeatedly, the Swordfighter will slowly shift backwards. Side taunt: Spins their sword with a flourish before taking a stance, holding their sword in a reverse grip behind him. Down taunt: Poses with their sword facing upwards. Based on Link's down taunt. They raise their sword up while spinning twice on one foot. Afterwards, they briefly enter into a one-handed inside stance before thrusting the sword outwards. Drops from the sky, plunging their sword into the ground. They then remove it whilst performing a flourishing spin, which is followed by an inverted roundhouse kick, and poses with their sword pointing outwards. Performs a low-angled inwards slash, jumps up while spinning twice, and then does a low-angled outwards slash upon landing. Afterwards, they bring their swords up towards their body and then poses with it lowered. Although the Mii Swordfighter does not appear in the World of Light opening cutscene, they were vaporized and later imprisoned alongside the rest of the fighters (Kirby) when Galeem unleashed his beams of light. In the mode itself, Mii Swordfighter can be fought in the small town square where Timmy and Tommy's is located, north-northeast of the first crossroads. Defeating Mii Swordfighter automatically adds the default Mii Swordfighter under the name Mii with a default 1111 moveset to the list of Mii Fighters for all modes where Mii Swordfighters are usable. Cannot be restored if deleted. Mii Swordfighter's Fighter Spirit is available periodically for purchase in the shop for 500 coins. Unlocking Mii Swordfighter in World of Light allows the player to preview the first spirit below in the Spirit List under the name "???". As a Fighter Spirit, it cannot be used in Spirit Battles and is purely aesthetic. Unlike most fighters, the Spirit for Mii Swordfighter only uses the default Swordfighter's artwork from Ultimate. Mii Swordfighter in Mii Fighters' fighter card. Mii Swordfighter taunting on Battlefield. Mii Swordfighter striking Villager with his dash attack on Hyrule Castle. Mii Swordfighter shielding on Mario Circuit. The Mii Swordfighter has a purple background effect when using a Final Smash (similar to Dark Pit's background effect). This is different from the other Miis, whose background effects are blue. Additionally, like in Super Smash Bros. 4, they are incapable of wall jumping making them the only Mii Fighter who can't wall jump for extra vertical recovery. The Mii Swordfighter is the only swordfighter that possesses a reflector, in this case Reversal Slash. All of the Mii Swordfighter's chargeable special moves still have the same charging sound despite the aesthetic changes to the moves. The Mii Swordfigther is the first character to have their counter changed in terms of launch trajectory as it now sends vertically due to it now being an upward slash. This page was last edited on April 16, 2019, at 05:30.